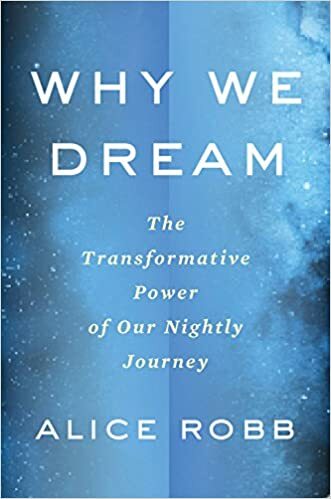 Why We Dream: The Transformative Power of Our Nightly Journey – loudlatinlaughing – Euge! Euge! Liked this primarily because it got me thinking about remembering my dreams, which is step one to actually remembering them. I wish I’d liked the rest of the book as much as the introduction. Improving your dream life, Robb asserts, is as simple as thinking more about your dreams, sparing a moment before sleep to set your intention to remember, and writing them down in the morning. And just like that, you’re accessing your whole life, not just the 2/3 of it when you’re awake. Lucid dreaming sounds like something worth spending time to accomplish, too. The essence of this seems to be the “reality test” that you give yourself every hour of the day to see if you’re awake or not. Since we do a lot of the same things when we’re asleep that we do while dreaming, the theory is that you’ll ask yourself if you’re awake when dreaming and when you realize you’re not, you get to take control of the dream. Dreams are where we work out problems that we’re encountering in our waking lives and hone skills we’re learning. Hugely important for everyone’s sanity and health. We forget most of our dreams because the chemical necessary for remembering isn’t actively being secreted by our brains while sleeping. Another weird thing: 117 otherwise healthy young men in the Midwest began dying in their sleep over a few years in the 1980s, from nightmares (Laotian immigrants who weren’t adjusting well and who may have had heart conditions).